Note: The technique of polishing takes away the silver plating slightly exposing the copper wire. As a result, the color may vary from silver to brown to gray. 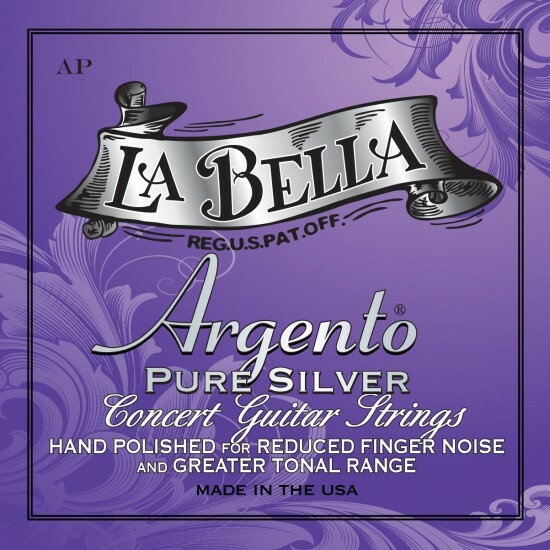 The Argento Hand Polished Pure Silver strings are, in our opinion, the best highly polished strings available from any manufacturer. La Bella pairs clear nylon trebles with basses that are hand wound with 99 percent pure silver wire, then hand polished to smooth the surface for a frictionless feel. The tonal range is amazing — all the way from bright to dark — and the strings last a long time. This is one of the few places I can even find my strings. Couple that with fast service and delivery, and I could not be happier. My son and I built our classical Spanish guitars during the mid 1990s. This was a most precious time for us to become bonded through this instrument crafting and the subsequent music we shared together. We built these guitars around the D'Addario silver flat wire strings, which are no longer manufactured. For the past 13 years I played little on my guitar because the sound that I knew the instrument was capable, could not be produced with other strings. Fortunately, my grandson wanted me to teach him to play guitar and so I got out my guitar and began to search the internet to hopefully find a manufacturer of pure silver strings. To find that La Bella was the only firm to produced such strings was a most welcome discovery. The shocking element was the price....$50!! My memories of the sound that my guitar was designed to produce, was dependent upon having those silver strings, so I bought a set to test out. When I put the strings on the guitar, the sound was as beautiful as I remembered. My emotions surprised me as found myself weeping at the recovery of my good friend...my guitar. The clarity, mellowness, and warmth of the sounds produced are just right for a personal, small space environment that I play in. I have not tried the guitar in a larger chamber, so I cannot comment on the projection of sound with these strings; but with this aspect I am unconcerned, as I have no intention of playing in public anyway. As for the service provided by stringsbymail.com, this also surprised me; but I suppose that I should not have been, as the price of the La Bella silver strings does put them in the most expensive category. The hand written notes accompanying the strings I found charming; like I had purchased a Rolls Royce Silver Shadow or a Steinway Concert Grand Piano. Stringsbymail.com even assigned Matt as my personal string consultant, I have never had a professional string consultant before. The strings arrived three days after I ordered them, very quick service duriing the height of the Christmas holiday shipping season. I would rate my experience with stringsbymail.com a 10 out of 10 and would highly recommend them to other guitar musicians.